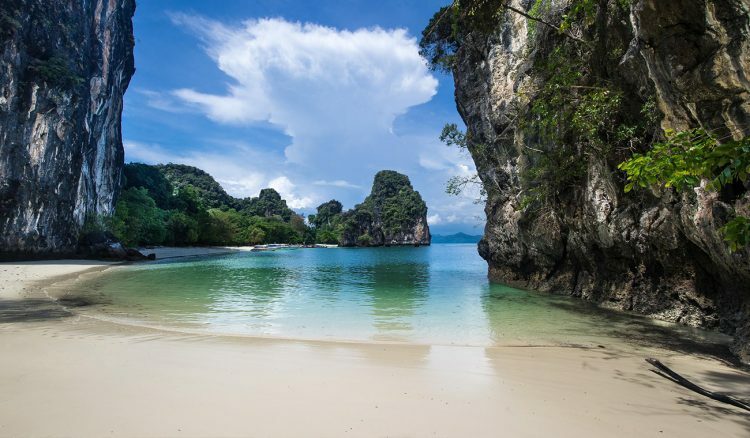 Krabi in Thailand, is one of the most relaxing places in Thailand, with its quiet beaches, Krabi is the place where people from all over the world come to see and explore these picture perfect beaches. The place which is famous for the tiger cave ; Wat Tham Sua, where the monks live and worship in the caves. It is also a home to a variety of birds and animals because of its rich flora and fauna. There are so many beaches around but these are some of the popular ones you can visit. Bamboo island, has the clearest water, amazing coral strewn white sands and thick green bushes in the centre, is the perfect place for snorkeling and to discover the underwater world. Since it is away from the crowd, one can enjoy uninterrupted time to admire the beauty of the island, and swim in the clear water. The cluster of bamboos provides the perfect shade and greenery for a nap on the beach. Surrounded by high limestone cliffs the Railay beach attracts a lot of rock climbers from around the world. It is a lovely place to stay with beautiful bungalows scattered around. The West Railay beach, is connected to the east side by the trails through the thin jungle cover and is the main destination for beach lovers. Besides rock climbing, there are other water sports like kayaking and snorkeling.This unspoilt land is the most spectacular out of all the beaches and only accessible by boat. If you are on the lookout for an action packed day, then Ao Nang beach is the place for you, this small bustling beach is the liveliest with cafes, shops and hotels and because of its nightlife it attracts a lot of crowd.The blue water, soft sand and a gorgeous mountain in the backdrop, is a perfect place to unwind. The large lagoon chamber located in the middle is like a room and Hong in Thai language means room thus the name Hong.The beach is separated into two parts by a huge rock and the more beautiful part is located between the rock and the big limestone cliffs. The color of the water changes from emerald green to turquoise depending on the tide level and a lovely place for snorkeling and swimming. So pack your swimsuits, sunglasses and sunscreen and head off to these beaches this summer. Next articlePunjabi Singer-Turned-Actors Who Are Here To Take Bollywood By Storm!